Look out, another knot of tortured researchers just went past. All this time we’ve been pouring money into planting trees and stealing land from farmers because we were sure that trees would cool the world. (Just like solar panels do, yeah?) But life is so complicated — for years now some researchers have been quietly wondering if more trees were actually going to warm the planet instead, but they didn’t want to say much. It turns out that while trees absorb the sacred CO2 (that’s cooling!) they also emit methane (that’s warming! ), and terpenes (cooling) and isoprene (warming and cooling!) If that’s not complicated enough, then there is the albedo effect. Trees are dark, they absorb more sunlight than bare ground and snow. So depending on where they are planted, that makes for “warming”. Then some VOCs or volatile organic compounds also seed clouds. Trees are supposed to slow global warming, but growing evidence suggests they might not always be climate saviours. At the same time, some researchers worry about publishing results challenging the idea that forests cool the planet. One scientist even received death threats after writing a commentary that argued against planting trees to prevent climate change. Although the analysis relies on big assumptions, such as the availability of funding mechanisms and political will, its authors say that forests can be an important stopgap while the world tackles the main source of carbon emissions: the burning of fossil fuels. “This is a rope that nature is throwing us,” says Peter Ellis, a forest-carbon scientist at The Nature Conservancy in Arlington, Virginia, and one of the paper’s authors. Australians should — in theory — care more about this than almost anyone. We are one of the countries that did count carbon storage. If it turns out that land clearing cools the planet, Australia is stuffed (carbon accounting-wise): Our emissions per person fell 28% since 1990, but the largest single factor there was “land use” — meaning we stopped clearing and let regrowth take over some farms and paddocks. Then we shafted the farmers who owned the land and couldnt use it. The 1997 climate treaty known as the Kyoto Protocol allowed rich countries to count carbon storage in forests towards their targets for limiting greenhouse-gas emissions. In practice, few nations did so because of the agreement’s unwieldy accounting mechanisms and other factors. Researchers have known for decades that tree leaves absorb more sunlight than do other types of land cover, such as fields or bare ground. Forests can reduce Earth’s surface albedo, meaning that the planet reflects less incoming sunlight back into space, leading to warming. This effect is especially pronounced at higher latitudes and in mountainous or dry regions, where slower-growing coniferous trees with dark leaves cover light-coloured ground or snow that would otherwise reflect sunlight. Most scientists agree, however, that tropical forests are clear climate coolers: trees there grow relatively fast and transpire massive amounts of water that forms clouds, two effects that help to cool the climate. Atmospheric chemist Nadine Unger, then at Yale University in New Haven, Connecticut, conducted one of the first global studies examining one part of this exchange: the influence of volatile organic compounds, or VOCs, emitted by trees. These include isoprene, a small hydrocarbon that can warm the globe in several ways. It can react with nitrogen oxides in the air to form ozone — a potent climate-warming gas when it resides in the lower atmosphere. Isoprene can also lengthen the lifetime of atmospheric methane — another greenhouse gas. Yet isoprene can have a cooling influence, too, by helping to produce aerosol particles that block incoming sunlight. Trees emitting methane? Shame no one knew this before: Ban trees! The latest findings are piling on even more complexity. Ecologist Sunitha Pangala at Lancaster University, UK, spent much of 2013 and 2014 in the Amazon rainforest, where she placed gas-measuring chambers around the trunks of more than 2,300 trees. “What we were really surprised about was the magnitude at which these trees are emitting methane,” says Pangala. She and Vincent Gauci at the Open University in Milton Keynes, UK, and their colleagues reported in 2017 that trees account for around half of the Amazon’s total methane emissions5. Ha! Were it ever so. A baseline of a wildly random chaotic open system…input any variable…result? Wildly random answers…all of which can be true or false. A soothsayer’s dream! Right. It seems that the Green’s Perfect Climate is totally unachievable. Life in all it’s variety, shapes, forms, mobility and immobility will thoroughly sabotage any and every attempt at it. At least it shows that Human effects are just part of the overall noise. More eco-peddled uncertainty and chaos. Deforestation was until now a keystone in the eco-arch … consider that the temperate zones were until relatively recently swathed in forests or covered in native bush. There must be a brewing battle for funding with the realisation that the AGW nonsense is disappearing up itself. Are the watermelons are turning against Gaia? Eventually labelling black as white has to mess with your head….people eventually realize they cant keep doing it, unless they have lost the plot and their minds have actually fractured…. Most people are sane, eventually it manifests itself as rational thought after a period of being mislead. “I met a guy with a didgeridoo and he was playing Dancing Queen on it. I thought, “That’s Aboriginal”……. Seriously folks – stop and consider the utter triviality of the core question exposed in this article and the imbecility it generates. Of course they bloody do – how else can they absorb and store CO2 through photosynthesis so that they produce “renewable” fuel! Have not the OCO2 satellites shown that tropical forests are major emitters of CO2, and that is why there has been little publicity to their findings for a couple of years? surface – also Ozone is a highly reactive gas which will oxidise and destroy hydrocarbons and other atmospheric organic particles. Do these people not know ANY chemistry? If she had placed one around her own trunk she would have got an even bigger surprise. The world is very close to attaining peak stupid. Is this really what happens when we reach a point when all the basic needs of life are satisfied? Then the Elite will start a war to send people backwards …..the Elite are IMHO, evil. They thrive on death and misery…..demons seem to have a field day with them. It’s certainly above all past `timberlines’ now! But there is no way the world can actually reach peak stupid – someone (climate scientist) will always go one better. “Money cools our planet.” No money, the planet warms. I’m a member of a 4wd (Brand x) website and someone has watched Attenborough at Davos and is convinced in CAGW , within seconds I get called a flat earther after putting forward rational evidence based arguments . Sort of says it all but now some are saying if you own a 4by and are a true believer there is something wrong with you , sell the 4by and get it crushed so no one else can use it then buy a pushie . Aug, 2018: Contrary to popular belief, more of the world is covered in trees than 35 years ago, a new study has found. NB: We’re gonna need a bigger safe space. The billion trees should be easy to achieve, they could use the 850 million trees that Bob Hawke promised but did’t deliver on when he promised to plant a billion. Labour Party New Zealand rehashing the Australian Labor Party promises. There were rumours of the wealthy buying up south america and new zealand and building underground bunkers….if true, I wonder why? Even wealthy people would probably feel a bit daft building above-ground bunkers. Stumbled onto Auckland University student radio 95bFM’s ‘Green Desk’ yesterday at lunch/smoko, as some young womyn-woke fresh from COP24 announced her Three Commandments To Save The Planet: Give up meat for a plant-based diet; Give up long-haul air flights; Give up personal cars – internal combustion AND electrics – and rely solely on public transport. This morning (on another radio station) I heard Princess Jacindarella in Davos, Switzerland say we must all “take action” because those who don’t will be on the “wrong side of history” [insert applicable expletive/s here * ]. Greg, your young womyn-woke fresh from COP24, should indeed do what she wishes. That is the shortest route to waking up about the stupidity of her ‘Suggestions’. That sounded a little like a shot across the bow at sceptics…..
Or was it the sound of an imaginary round being chambered? The Elite apppear to be a bit deranged ( witness the hysteria about Trump ), so who knows…. I won’t post a link – ew feel so dirty – PM Ms Ardern had Slur David Attenborough sitting on one side and the Most UN-Holy Reverend Al Gore Junior on the other, just like a holy trinity of the Church of Climastrology (donations always welcome). She’s come a long way – and flown a few filthy carbon air miles and enjoyed limousines and 5-star hotels and tea with old Lizzie – since her time as the President of the International Union of Socialist Youth  and being a gofer for UK PM Tony Blair [during his 'moral invasion' period]. She loves Five-Year Plans. You can judge someone by the company they keep…. Last i looked, the Nyew Zulund PM was a green commie…. Anybody care to run a correlation on that with Average Global Temp increase over the same time period? That’s speared that CO2 man. It’s the BURNING of the trees to grow palm oil plantations and soy crops–making soot[ black carbon] that deposits on the polar ice and blackens it … that reduces earth’s albedo….likewise incomplete combustion in older diesel engines and soot from China’s old coal plants blacken the polar ice…nothing to do with CO2. They know it …warmists testified to Congress on it in 2010..estimated the black carbon and the GW Cycle it sets up…not just at the poles but on the glaciers and permafrost[whence it releases methane]….are responsible for half…maybe more of any global warming there is. National Geographic has written about it extensively….with dire warnings…and nothing happens. The burning goes on and the polar ice is black with soot. Mitigation of the black carbon would have almost immediate effect, but warmists never discuss it….or anything else but CO2. IMO they don’t want the world to see the result of such mitigation because it would prove that CO2 is not the major cause of the slight warming there is. hence this nation is stuffed. Crash and burn here we come. I know who I will be putting in the press gangs to fix the roads….greenies…lots of greenies, leftists, and anyone else who aided and abetted this nonsense. They can literally fix the mess they have created. I would not stop there. I would also include teachers, lecturers, politicians (of any persuasion) and scientists who believe in CAGW. … ask them some simple question first and then shoot those who give the propaganda as an answer. Australia’s eucalyptus trees are a health hazard and should be kept well away from humans. Got help you if the California lawyer, stymied by the bankruptcy of PG&E find out that it is all your fault! Just ship koalas to California! Problem solved! Seemples! Do koalas eat blu gum leaves ? Not sure. The problem is mind fumblingly simple to overcome. Just plant gums that have a high Alberto. Ghost gums are white and would instantly address the problem. hello?? There…i saved the planet again today. Snow gums also have a high Alberto. Thanks for bringing my attention to this. Rather, a product of being educated in Australia in the 1950s. On the subject of koalas, apart from Greens, they are the world’s most stupid mammal. They are one of the few animals whose brain has actually shrunk due to evolution and their brain is significantly smaller than their brain case. They are so stupid that if presented with leaves on a horizontal surface rather than their customary position on a tree, they won’t be able to understand to eat them. Those facts used to be mentioned in the Wikipedia article on koalas but now appear to have been censored out. Correction: fortunately those facts do still remain in Wikipedia, my mistake due to not fully expanding the article. The Vegan in the Room relating to Koala intelligence is that they have massively undeveloped brains because their diet has all the nutrition and energy of, well, gum leaves. This is after all an animal that spends 20 hours a day asleep and most of the other 4 hours trying to remember what they were doing before they nodded off. They break up this cycle by suddenly turning incredibly violent for not logical reason and lashing out with their claws. Koalas, despite what the tourism industry likes to tell us, are actually vicious little pricks that will, if given the chance, totally Go Ya. The Dropbear by comparison is a meat eater with a much larger and more advanced brain. This increase in intelligence has made them cunning little buggers that are exceptionally good at base problem solving, use of primitive tools and completely avoiding study by the academic community. Clear moral to this story? Eat plants? Small brain that is easily confused and vague but prone to irrational aggression. Eat meat? clever little buggers. There you go kids, don’t be a vegan or the best you can hope for in life is being cuddled by tourists. John Joseph Brown (Australian Minister for Tourism) after one unleashed a stream of foul smelling pee all over his expensive Italian suit. And, probably the best one the country has ever had. Eating such coarse leaves means that most of it’s blood has to go to it’s gut so there isn’t enough left for the brain. men have a similar problem. Yes, but now we have new razor blades, so all problems are now solved. Ah! Greens. Voters at least. You’re not being at all nice to koalas … and too nice to Greens. I’m assuming they mean fight global warming since as we all know here climate change is real and always has been real since year dot. We3ll as we all know here there has been no global warming for over a decade and more likely we are at the early stages of global cooling. It really is about time the people were told the truth. This is the reality, there is nothing puny humans can do to stop global cooling. 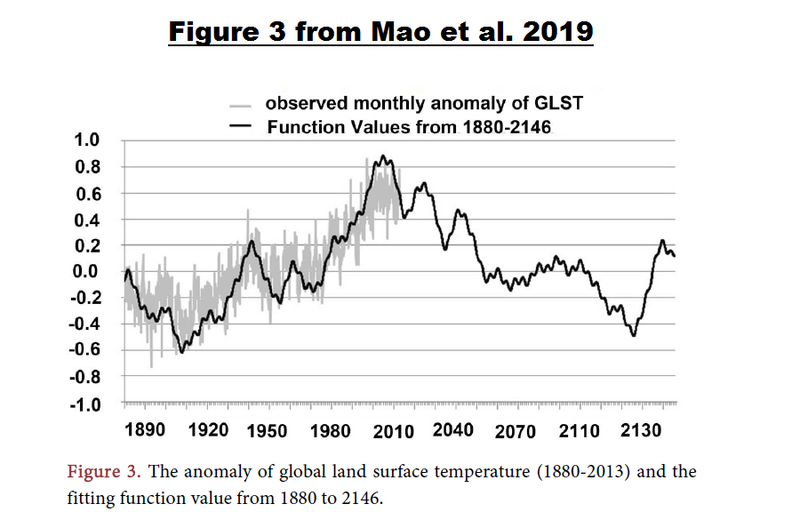 By the way, the Mao paper is a curve fitting exercise and shouldn’t be taken seriously. Most of climate science is a curve fitting exercise and shouldn’t be taken seriously! Fixed it. Pfft. “Climate Change”. So last Millennium. Everyone knows the real enemies are sunrise and the tides. These are the issues we should be bankrupting our civilisation over. Only the West is mad since pretty much the rest of the world is not taking any notice of the CAGW nonsense and instead hurriedly building many hundreds of new coal fired power stations. Now if they all believed that CAGW were real they would not be building them and instead would be building nuclear power stations (on top of the ones they are already building). For whatever reason, and we can imagine at least a couple of valid ones, the West is deliberately committing economic suicide alone. Just to complicate things more, I am sure you have noticed that it is cooler under a tree on a hot day. Much cooler if you are holding an iced drink or a chilled beer. Preferably one in each hand. Much climate research must be written with their toes cause it sure sounds like they have a drink in each hand as well as a few in the belly. That is quite amazing Jo, thank you. I didn’t know enough about Kyoto, but when I looked through some Qld Govt info on vegetation management I realised the purpose – to facilitate dodgy “carbon accounting”. Why isn’t that presented EVERY time people argue against the current restrictive land clearing laws? I couldn’t read it because of a paywall. I get cheesed off when one of the online ‘papers’ won’t even let you read part of one article. Needless to say, it is not one to which I’d choose to subscribe. I did, thank you Another Ian. Quite a few papers now wont even let you comment on stories unless you cross thier palms with silver….its a great way of making money from the true believers and keeping those of us who couldnt stomach giving the Moloch-Stream Media our hardearned…..
Of cause forests cause global warming, that’s why the Greens insisted Dogwood forests in the USA be cut down, transported across the Atlantic and used as fuel so as to save using the 600 million year old trees that Drax was using. Quick, everyone in SA & Vic go cut some trees down and stop this hot weather. Oh, but I was sheltering under that tree. Meanwhile, average wholesale electricity prices in SA/Vic for January have averaged $120/MWhr, and last two days averages have been Monday $187/167, Tuesday $271/255 with Adel max temps 34/38, and Melb 24/26. Place your bets on what those prices will be for the rest of the week, with Adelaide forecast max temps 40/45/33, and Melb 25/38/41. On ABC TV this they had a reporter saying Adelaide was forecast a record breaking heatwave over the next few days, and that he was talking to cafe owners who planned to shut up shop for a week. But then he let slip the cafe owners said they just couldn’t afford to pay the electricity cost. Here we go – likely “load shedding” (i.e. brownouts) over the next couple of hot days in SA/Vic. From AEMO: Forecast LOR2 condition in the Victoria region. 1. From 1530 hrs to 1930 hrs 24/01/2019. The forecast capacity reserve requirement is 1066 MW. The minimum capacity reserve available is 180 MW. 2. From 1130 hrs to 1600 hrs 25/01/2019. The forecast capacity reserve requirement is 1099 MW. The minimum capacity reserve available is 622 MW. Heard on radio that a couple of coal generators in Vic/NSW are down for maintenance. And for SA, lack of reserve tomorrow: From 1800 hrs 24/01/2019 to 1830 hrs 24/01/2019. The forecast capacity reserve requirement is 316 MW. The minimum capacity reserve available is 256 MW. Hope those diesel generators are primed. SATGN1 delivered 15 MW for about 10 minutes yesterday afternoon. On this topic does Global Warming(tm) make for shorter heatwaves? Friday and the weekend however are forecast to be almost jumper weather before the temp finally finds it way slowly back into the 30s early next week. So… Summer, Summer, Summer, Stinking, Cool Change, Mild, Mild, Mild, Low Summer. ‘Heat Waves’ are about 20 hours long now, are they? I have, for about a decade, pointed this out to people. Large forest, with the way they release weather/climate influencing volatile organic compounds (VOCs) like isoprene, methane, alcohols, water, and even pollen, allows them to very roughly control their local weather. Also of note is this write-up of the work of Abigail Swann a professor at the University of Washington, where she runs the Ecoclimate lab. There’s a lot of information on how forest affects the water cycle not only in each individual forest but across the world. Mist hangs over the Amazon rainforest shortly after sunrise. Forests routinely transfer extraordinary amounts of water vapor into the atmosphere — the equivalent of “flying rivers” — and scientists are only beginning to understand the complex consequences for rainfall and climate at remote locations. decades ago an organic farmer on the SA Eyre Peninsular who planed large numbers of trees along his fence lines as windbreaks, found that rainfall increased by 10-15%. Trees ‘en mass’ definitely influence rain by pumping moisture into the air as illustrated by the Amazon research. That tends towards cooling local climate both directly through the moisture in the air and via the clouds providing more shade. But do trees also release compounds that have other effects ? Why not. We hardly do any research into this.So it is the big known unknown. An experiment at Charleville had mulga from original population, several thinning densities and completely cleared, and monitored rainfall and water useage. All treatments used up all available water. “In areas of under 600 mm rainfall in Qld the chance of dryland salinity is negligable”. Summer storms, high plant water use, high evaporation, small chance of deep percolation. And this was in print before that beat-up. Ian,the Amazon itself i the major example of trees effecting climate & rainfall.. Yes, it’s all a globalist conspiracy. But to pull it off a generation had to grow up staring at little screens while clutching joysticks or playing with buttons and knobs. The goal was usually to save the solar system or the whole Milky Way from nasty invaders. Fortunately, under the economic system called Fractional Reserve or Print-Some-More you can’t go for longer than ten years without making a whole lot of new stuff you don’t need to replace the old stuff you didn’t need. So Print-Some-More works quite efficiently with Publish-or-Perish. But it can all get terribly confusing for Gabrielle Popkin. I would just like to point out some stupidities of science in this matter, yes the darker color absorbs sunlight but is that light re-emitted as heat or turned into carbohydrates and oxygen through photosynthesis. Because of the huge leaf surface area much of this energy is released as enthalpy of water vapour. At our house we make these cool micro climates all over our property, these intellectuals obviously live in city skyscrapers. From observation vehicle engine temperatures seem to run somewhat higher here in western Qld where the road is going through mulga scrub than where it is through open mitchell grass plains. And if your air conditioner is temperature marginal it will usually down tools in the mulga. Did I say mulga or rainforest? So there was no way this carefully designed, “objective” scientific experiment was possibly measuring CH4 from the well understood biological breakdown of the vegetation detritus in the world’s largest Equatorial Rain Forest? Is she per chance a student of fan of da Mann? In other words insects ( termites etc) digesting woody materials for food and thus releasing methane. Now obviously those trees are the problem – NOT.. I wonder if she sprayed an area with some toxic chemicals to kill all the insects and then checked the methane levels. Hmm…well she surrounded them with gas chambers and that can’t be good. Methane is higher in infected trees. A fungal infection caused by methane-producing archaea. Rainforest trees would be ripe with this! Not one mention in the papers! The whole thing (of the article) is totally flawed. Most of the abledo is from ice, surface snow etc. and ice crystals in the high cloud covers. This depends on the season and the circulation (cloud producing) at any given point. THEN you have to do the spectral analysis of exactly what range in the IR is reflected, by what mechanism. Forests like the Amazon contribute to local water vapor production by aspiration in contrast to a desert with no vegetation. This produces clouds. It will be clearer as more studies are completed. The latest findings are piling on even more complexity. Ecologist Sunitha Pangala at Lancaster University, UK, spent much of 2013 and 2014 in the Amazon rainforest, where she placed gas-measuring chambers around the trunks of more than 2,300 trees. “What we were really surprised about was the magnitude at which these trees are emitting methane,” says Pangala. She and Vincent Gauci at the Open University in Milton Keynes, UK, and their colleagues reported in 2017 that trees account for around half of the Amazon’s total methane emissions. this is a review paper. It is reviewing a bunch of other papers and pulling together some meta ideas. You, and others, are critiquing the primary research using the descriptions within the review when, clearly, the review is summarising and not just reporting every detail of the primary research. To critique detail of the primary research (like did they eliminate background methane from their analysis of tree output) based on the summary in the review is absurd. So what? Are you saying that the review is flawed? If so, whole point of the post is invalid. Secondly I’m not critiquing the research, I am saying that the effect of any methane release by the trees is insignificant, as quoted. That’s poor comprehension. It is clear that I was saying your critique is flawed. its a quote, comprehension is poor on your part. Hey wait a minute even the trolls are arguing the point , what’s going on here ? Love it when they demonstrate that the science is not settled. Trees emit methane, CO2, and all sorts of wonderous hydrocarbons and other volatile gases, some of which undoubtedly would be classed as strong GHGs. They have done so since the birth of the biosphere. ! Even the bassest of algae can emit some pretty noxious gases and liquids. ITS ONLY NATURAL.. just like CO2 is. There is something fundamentally wrong being preached here : that trees produce methane. Methane is only produced in anaerobic environments.. Where is trees are there any anaerobic environments ? - In the roots ? The growth of roots is fueled by the sap made in the leaves…and distributed to the roots.. But roughly 80-90% ( it varies by species) of a tree’s mass is made up in non living woody/cellulose tissues. this woody material is subject to attack by white ants ( termites ) that feed cellulose t fungi to grow their own food..Now that process deep within the Earth generates methane and is anaerobic in nature. And this is so for all woody plants.If this process did not happen the world would be covered with dead, un-decayed timber.. It was reported back in 2006! C’mon PF. How much methane is in the air anyway? So Trees emit methane … So What? Peter Fitzroys emit methane … ooh, we’ll have to stop that! They also emit CO2 … Right, gotta reduce those emissions to ZERO! Before the Climate Overheats! It’s gonna exceed 1.5 ° and catch on fire! you can find the answer to that by reading the paper. read first, sarc second. which paper? Are you talking about the Nature review piece or the original research that I was commenting on that pattoh is critiquing without reading? Do me a favour and gives us a link? Yep, they are all there, had a look at a couple. ” less incoming sunlight” clearly written by the ill informed, sunlight (visible) doesnt HEAT only IR does! IR is not sunlight in the true meaning. Global growth is slowing, trade conflicts are worsening, ***problems related to climate change and environmental protection remain unresolved while big changes are ahead of us as digitalization gains traction. “Independently, each [issue] would be a daunting challenge — all these challenges at the same time are a really big challenge that can only be resolved through cooperation,” says the president of the World Economic Forum (WEF), Borge Brende. But the willingness to cooperate has been declining globally. All in all, some 70 heads of state and government will be there as well as the heads of the United Nations, the International Monetary Fund, the World Bank and the World Health Organization. The list of participants counts some 3,000 people, also representing the realms of business and ***science, as well as various environmental and development agencies. According to WEF founder Klaus Schwab, the world lacks a vision, ***and the Davos forum could help out there. He’s aware, though, that proposals made by elites tend to be viewed skeptically by ordinary people around the globe. But he and the forum don’t believe that everything should be subjected to the forces of the market. He said he warned as early as 1996 that globalization in its current form would not be sustainable. In my observations of this whole climate business, it appears that geologists [Geologist – “The sun, not CO2, drives Earth’s climate”] and many astrophysicists are most of the skeptics than other disciplines. Or the more you know about some unrelated science (to atmospheric science) the more alarmist you are. Then we shafted the farmers who owned the land and couldnt use it. keeping parts of their property tree covered. If they do decide trees warm, then there will be a whole lot of very upset people who make their living from carbon sequestration in trees. I knew a guy out near Parkes. He had a couple of hundred hectares of rocky ground and shrubby trees. But he put in a clearing certificate anyway, and within a couple of days the offer of being paid to leave it uncleared was made. Taken with glee. He then brought the farm down the road for a pittance, and did it again. Nice way to augment a farming income. It’s a pity we don’t have that scam here in SA. You gotta learn how to play the game. Now that its back in its “native” state, advertise wide and loud that you intend to clear it again. In Qld old growth doesn’t qualify. What they’re after is cleared country with a potential fastgrowth rate. I knew a retired farmer from WA who wasn’t that keen (I’m being polite) on those farmers who ‘planted’ gum saplings during a drought. A picture or two of the bare land, followed by a picture of the saplings in the ground attracted funds from Europe where they were used as evidence of “carbon capture”. The farmer got money, the European companies sold Carbon Certificates and the buyers got a smug warm glow for their money. 2 years later the process was repeated. An excellent example of how such arrangements can be rorted. But the next step has to be anti-rorting measures, eg by drone surveillance. And so, the drama keeps progressing. About 15 years ago the tree thing was big. However, if one studies trees (or watches railroad tie fence posts) in winter, it is easy to see and feel the warmth of dark wood even with Sun low in the sky. The Sun facing side of dark trees (and such) absorb energy and warm markedly. We visited a forest once with much snow on the ground. Old stumps stuck up, and around them the snow as gone. We weren’t the only ones that noticed. A swarm of Ladybird Beetles covered the sunny side of the old tree. I have 35 mm color slides. I should dig them out and digitize them. Anyway, as the “tree thing” started to gain traction, it died almost as rapidly. Several studies were published that showed the heat gain possible with evergreens at mid-latitudes. I did not save links. I think this was just about the time the internet was coming on. Memory fades. So it was discovered that the UHIE (Urban Heat Island Effect) wasn’t restricted to the Urbs? What the Green Berets movie did for war, Nature does for the climatariat. Keep the punters in line by spouting a lot of sentimentality and piety. Mr Attenborough, 92, said the world faced certain catastrophe if climate change is not dealt with immediately. His comments came while he was being interviewed by Prince William, Duke of Cambridge, on stage in front of attendees at the World Economic Forum (WEF) in Davos, Switzerland. Attenborough is over rated in my opinion, a good TV narrator presenting the hard work and research of others, but not a demi god. Everyone tries to drive the news cycle. The word from Davos is that the world is going to hell. World economic crisis. China collapsing. Of course Mr Hairdo, John Kerry says Trump should resign. In Australia we are told a climate and water expert is going to investigate the mysterious lack of water in the Darling river. The Murray however is full, as it was right through the long drought. That’s what 22 locks and spillways will do, but only a Climate Expert can find a problem. In the US, it has become clear that the utterly contrived attack on a Catholic Boys school student was supported by an elaborate system using a fake Twitter account to ensure the video went viral but could not be traced. The boys were criticised by their own school and their church and threatened with expulsion until a rival video showed they were the real victims of abuse and intimidation. This shows how the left are becoming expert at exploiting a very compliant media to create a false narrative. The most extreme are the violent Anti-Fascists who are violent fascists pretending to be victims. We saw all this in the 1930s and it is copybook perfect. As for mankind wrecking the planet, we are now conspiring with trees and grasses and bushes and wild animals to change the climate. Eliminate the people, the greenery, the animals, the insects and the planet will be saved? Really? For whom? Attenborough is joined by Australian medical scientist Professor Peter Doherty who is also a climate crusader. He has no qualification or knowledge in the area as far as I could make out. We traded emails, which went on much longer than I anticipated. At his suggestion I read his book; “The knowledge Wars” which is partly about his promotion of AGW climate science. He flits about from one topic too another. He uses standard debating tactics to try to slam dunk the opinions he does not like and frequentlty appeals to the the precautionary pronciple when his arguments are weak. After a while it was almost comical. I started to wonder how some one with some much predjudice and apparently shallow thinking could have won a Nobel Prize! Maybe it is not so hard if you stay on the conventional academinc side and have a bit of luck. Unfortunately Doherty has been on a few committees advising government, so like Attenborough has has been able to do a lot of harm with respect to climate policy. more on NZ. they definitely need to read jo’s thread! VIDEO: 1min07sec: Ngati Hine launch the Government plan to plant a billion trees. Those who have absorbed the Government’s grand plan for 1 billion trees by 2028 tend to make their case with a blitzkrieg of big numbers and lots of division and multiplication. Forest Owners’ Association president Peter Weir is among the maths gymnasts, but mercifully not before he cuts to the chase: “We’ve done it before”. Here we go with the maths again. “You have to ask what are the things that will make a farmer or owner of unplanted land suitable for afforestation plant it,” says Weir. For big commercial forestry companies, says Weir, today’s carbon prices are too low to compensate for land prices, and allow them to be active participants in the new programme. Talking to media at the occasion, the prime minister said that their target is to plant 10 billion trees in five years of their tenure to make the country green. “This is the beginning. Our target is to plant 10 billion trees in the whole country and this campaign will continue for 5 years. Aslam said the regeneration effort is being monitored by both the provincial forest department and WWF-Pakistan, working as an auditor. The Bonn challenge website estimates an economic benefit of the reforestation effort at $121 million for the province, in terms of carbon sequestration, better watershed improvement and future sustainable wood supplies. BoM is forecasting above average maximum temperatures for Feb-April, but when you examine their past accuracy it’s only just above 50% for key cities, and only 65% for most of Australia – more computer models required? What data is their forecast based on ? Data from weather station in big cities and towns, where there is a significant Urban Heat Island effect ? Very probably.. Nothing to see there then…. I decline to watch this nonsense Pat..
his TV shows were & are wonderful for presenting the natural world. But he well short of any great understanding of the Earth’s climate.. This is his best work to date. Hilarious! Loved the part where the bloke smashed his computer! Ahh … no, he doesn’t have a clue. Its come to my notice that you respect disciplines, they are the experts after all, but since the break down of the climate change peer review system, we can all be experts if we put our minds to it. Like the retired US school teacher who discovered the real cause of coral bleaching. Attenborough “knows” what is fed to him by the biased BBC script writers and producers. In any case if The Bro knows about monkeys and butterflies, that does not make him an authority on climate. We have another example of that closer to home in Flannery the tree kangaroo man / instant climate guru. More cash in climate than tree kangaroos, eh Timmy? Like El Gordo says, Attenborough is no more a climate expert than the rest of us. David Bellamy was a genuine naturalist who knew far more than The Bro, but he was sidelined years ago because he wouldn’t go along with the global warming crap. I’m sorry that William had to be involved in this garbage. It would have been better had Prince Charles interviewed the old boy — 2 gullible talking heads — but Chilla was probably too busy talking to his cabbages as usual. Actually it is quite fun viewing DVDs of his latter work as the PC crap is uttered. I love the bit in the NHM where he claims that Gideon Mantell discovered the dinosaurs. Leaving aside that he didn’t present any evidence until 6 months after Buckland (who Darwin like hesitated for at least 6 years), but he twice denied in writing that he had found the Iguanadon tooth, the basis of Attenborough’s claim. Of course Buckland was a son of a clergyman, therefore privileged (although not particularly wealthy) whereas Mantell was the fourth son of a bootmaker therefore GENUINELY WORKING CLASS and a suitable hero for the political correct. That his father owned his own house and shop, 6 other houses in Lewes and shares in 2 tanneries, employed over 23 workers, and had to hand £500 in cash to start his son’s career is regarded as immaterial to the myth. Still facts don’t count, Mantell is the working class hero of science. Poiter you must be on some of that stuff you’re crowd want testing , Attenborough lost me with ocean acidification and Coral bleaching , then he went into evangelist mode and it all went downhill from there . Far-right President Jair Bolsonaro touted a “new Brazil” in a speech Tuesday to the world’s business elite at this year’s World Economic Forum, in Davos, vowing an investment-friendly agenda and attacking left wing politics in Latin America. Greenpeace executive director Jennifer Morgan said Bolsonaro should not have been afforded the “prestigious platform” of the WEF in Davos, “because I think it just buttresses that type of approach that he is taking”. It was up to the company bosses present in Davos to push back and “actually prioritise the Amazon and reducing deforestation over their short-term business interest”, she told AFP, “because the Amazon is a fundamental part of how the whole planet works”. •On his first international trip since becoming president, Bolsonaro delivered the keynote speech at the World Economic Forum (WEF). •The absence of President Donald Trump at this-year’s five-day event has thrust Brazil’s premier into the spotlight, less than three weeks after his inauguration. “Brazil’s economy is still relatively closed to foreign trade and to change that situation is one of my administration’s major commitments,” Bolsonaro said, according to a WEF translation. “You can be sure that by the end of my term in office, our economic team, led by Minister of Finance Paulo Guedes, will position in the ranking of the 50 best countries in the world to do business,” he added. The 63-year-old nationalist secured a sweeping election victory late last year, promising to drain the political swamp and fight deep-seated corruption. The country’s benchmark stock index reached an all-time high at the end of last week, amid improving investor sentiment about the new government’s pension reform plans. The Bovespa, one of 2018′s top performing indexes across the globe, hit a record high, crossing the 96,000 mark on Friday. It followed heightened expectations that Bolsonaro’s government could reveal pension reform plans earlier-than-expected. “We think Jair Bolsonaro has a big chance to reform the country,” Francesco Starace, chief executive at Enel, told CNBC at WEF on Tuesday. •John Kerry said President Donald Trump should resign while speaking on a CNBC panel at the World Economic Forum in Davos, Switzerland. Off topic but only slightly, Sir David Attenborough is at it again; in a BBC TV interview (Davos 2019) with HR Prince William no less, (carefully prompting the questions) he makes his usual ‘doomsdayers’ pedictions for the end of the world as we know it, overpopulation, habitat & species destruction along with a good dose of human induced (and of course irreversible) man-made climate change. I believe (from ABC news today) that he also stated that we have 10 years in which to rectify the problem before it is too late. Note that it is 10 years and not 7,9,12, or 11. Just how does he know that? Sir Richard please tell us. My message to him is short and simple; Sir Richard get used to it, humans have arrived on the planet and they are here to stay. It cannot be undone. Managed of course, but not undone. And humanity will survive all else. WEF organisers insist they are making the annual forum environmentally sustainable, offsetting the carbon emissions generated by private aviation as much as possible through their own initiatives on the ground. “We encourage our partners from business and others to take that (offsetting measures) on,” Dominique Waughray, head of Global Public Goods at the WEF, said last week. Researchers have known for decades that tree leaves absorb more sunlight than do other types of land cover, such as fields or bare ground. Forests can reduce Earth’s surface albedo, meaning that the planet reflects less incoming sunlight back into space, leading to warming. Better tell World Champion glider pilot Ingo Renner about that! Ingo has spent most of his life flying gliders and that means looking for the best local hot spots where thermal up currents are to be found. Ingo’s advice is to avoid green crops and forested areas if flying over flat areas in Australia. They tend to be cooler. Rocky outcrops and bare dark soil is much better. There is not a contradiction here. I think the problem is what I call lazy writing, or poor wordsmithing. Bare dark soils and dark rocks absorb and warm. Air near the surface warms by conduction and become less dense, and more buoyant – thus rises – a thermal. Bare ground under clear sky will cool rapidly, the air becomes denser, and the thermal stops and reverses. With a full cover of growing green things, much of the energy is internalized during the sunlight hours. At night, the plants and water therein, with the load of H2O vapor above, will cool less rapidly. Convection, both directions, is lessened. There is lots more going on – as Jo and others have explained. Of course, because they transpire strongly which causes cooling. It’s why coastal areas have moderate temperatures whereas deserts have massive temperature extremes. Its not just mammals that practice thermal regulation and when it comes to cooling plants and mammals use EXACTLY the same mechanism. What a wonderful illustration of the term cherry picking, I see why it’s hidden here. Should she decide on a excursion into this balmy region, we should prepare a Darwin Award with her name on it. “First, armed groups attacked nearby,” she explains in a tired voice as we sit on plastic matting, five young children nestled close to their mother in Mali’s fabled city in the sand Timbuktu. The worst rains in 50 years in northern Mali washed away their entire crop. Those rains poured through the cracks in her mud home caused by an explosion an armed group set off. The increase in temperatures in the ***Sahel are projected to be 1.5 times higher than the global average, says the UN. “It hasn’t been on our radar screens,” says Peter Maurer, the President of the International Committee of the Red Cross (ICRC). The GGW aims to restore Africa’s degraded landscapes and transform millions of lives in one of the world’s poorest regions. This will be done by, among others, planting a wall of trees in more than 20 countries – westward from Gambia to eastward in Djibouti – over 7,600 km long and 15 km wide across the continent. Lyce Doucet could have done a little research! should have added a “sarc tag” when I posted BBC’s Matt McGrath piece on RE and the Sahel. The Sahara is a desert because it lies more or less under the edge of the Hadley cell where the air that rose at the equator (better the intertropical convergence zone ITCZ) descends back to Earth again. The already dry air from the tropopause is heated by compression as it descends, further reducing the humidity. This circulation causes a permanent high over the Sahara. How will installing 9 million km^2 (!!!!!!) of solar cells change that? Have a look at an atlas, most of the worlds deserts are under the edges of the Hadley cell. In his 1974 book Zen in the Art of Motorcycle Maintenance, the late American philosopher Robert Persig described periods of “lateral drift,” which most of us enter at some point, after realizing that the beliefs and premises we’ve been taught don’t always match our experiences. Lateral drift brought Persig into a “far orbit of the mind” that seemed unproductive at the time, but which set the stage for periods of fervent activity. Oil major BP purchased offset credits from two of the largest projects in the WCI cap-and-trade programme, a company official confirmed last week, but data suggests the fuel supplier is reselling many of those Alaska-sourced units on the secondary market. The European Commission is planning to host a conference on international carbon trade this spring to help clinch a deal on rules for Article 6 of the Paris Agreement after recent talks fell apart. How interesting, the claim is that warming from CO2 increases water vapour in the atmosphere (constant relative humidity with rising temperature) and since water vapour is the most significant green house gas this causes further warming in a positive feedback loop. Indeed the long standing claim is that this triples the direct effect of rising CO2. However the above states that more water evaporation causes cooling through extra cloud formation. So, more water vapour causes warming or cooling, whichever better suits the current thesis. What an obliging molecule water is. CanI suggest that Ross Greenood -2GB Moneynews- get himself a job with ABC Radio instead !! Story goes as many of you may know that one of the units at Loi Yang Power Station is down. So small crisis that can easily be overcome if everyone mucks in and raises their AC from say 18degC to say 24degC. Oh and don’t use the washers or the pool pump either!! This is all after Audrie has informed us that they have been planning for contingencies to get power from other sources and at the cheapest prices !! Also she went on about how our old coal fired power stations in NSW may not be adequate as they are more likely to ‘break down’ in this hot weather – like any/all machines do !! Well by this time I was ready to throw my portable radio out the window !! I have known previously that good old Ross, being a ‘money man’ with all his contacts in bussiness is an out and out green lefty on climate change. I for one will not be tuning in to further broadcasts of his show !! I intend to get on their web site and let them know how I feel. Also perhaps a phone call. 2nd rant, I hope that their SA and Victoria power grid collapses around their necks !! As it may well do so in coming days. No harm meant to anyone. Geoff your rant is warranted and good call , the AEMO know exactly what constraints they are under but blame renewables never . Yeah?? Ok …plant lots of cannabis is the answer then. We could pull out the cotton at Cubby and replace it with terpenes, the Greens would be overjoyed. Just love the look of bewilderment on their faces when their ‘electric’ cars don’t work . . . Fascinating, informed and open-minded discussion to date; from start to finish. This is by far the most Monty Python story. Trees are good. Trees are bad. We humans control the albedo of the planet which is 75% water surface anyway. That water weighs 340x as much as the thin air above it and does most of the buffering, creates all the weather, all the storms and of course, all the rain, snow, ice. The planetary rotation creates the wind and circulation. That’s it. It is a water planet, not a tree planet. Still we are supposed to believe we insignificant humans control the temperature of the planet. No, the only power source is the sun and by far the biggest, most significant green house gas is water. All life on earth is made from it. Dried you weigh nothing. You are mostly water. All the weather is caused by water and the sun. Water covers the planet, but somehow we humans are supposed to be in control? Call it a global megalomanical obsession. America landed men on the moon and suddenly humans are the Masters of the Universe. In fact Hollywood will not admit only America has done so. They are so woke. Woke non gender specific humans(huwomen?) landed men on the moon. Apparently. We do not control the planet. As best we can influence the rainfall on some land. That’s it. It’s not about the trees.